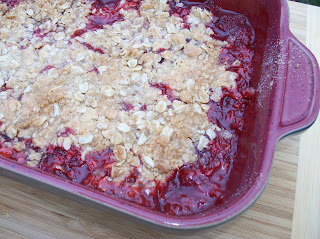 The sweet strawberries and the tart rhubarb blend well together in this yummy goodness. If you are unfamiliar with rhubarb, it is a very tart vegetable that masquerades as a fruit in summer desserts. This dessert definitely needs to be paired with your favorite ice cream or whipped topping. My favorite is homemade whipped cream. Enjoy! In a large bowl, mix together the strawberries, rhubarb, sugar, cornstarch and lemon juice. Pour into a 11 X 7 baking dish prepared with non-stick spray. In a separate bowl, combine the brown sugar, flour and butter until the mixture is crumbly. A clean hand or a pastry blender make this easy. Stir in oats and cinnamon. Sprinkle the crisp mixture on top of the fruit. Bake at 375 degrees for 40 – 50 minutes or until fruit is bubbly and the crisp is golden browned. 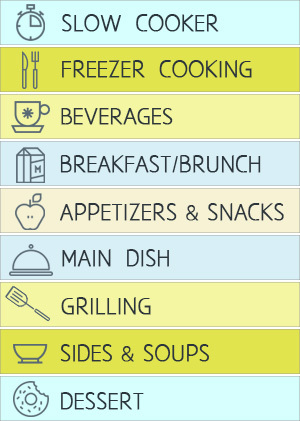 What are baking from your garden? 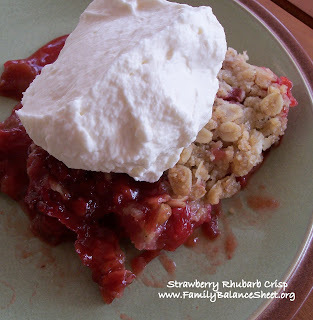 Print recipe for Strawberry Rhubarb Crisp. Yum…looks really delicious! I’m waiting for our blackberries to turn to make a few goodies.